Why should you manage your energy, not your time? Want to know how time and energy management can boost your productivity? Hands up if you think that if only you had a couple more hours in the day, you could slay all your goals and cross every item off your to-do list. But, what if I told you more time wouldn’t help? It’s hard to believe, I know. But think about the last time you got to work after a sleepless night. You were tired and groggy, barely able to keep your eyes open, let alone focus on the work in front of you. Every task took you what seemed like an eternity and at the end of the day, you felt like you didn’t accomplish much. Am I right? What’s Your High Energy Time (A.K.A. Productive Zone)? Truth bomb: time and energy management go hand in hand. Without enough energy to do the work, all the extra time in the world won’t make a difference. If you want to boost your productivity and get everything done, you need to know how to manage your energy, not your time. In other words, you need to become aware of your high energy time – I like to call it my “productive zone” – and use it to do your most important tasks. Don’t know where to start? You’re in luck. I’m sharing the time and energy management techniques I use to get everything done in my life and business below. These are the ultimate productivity tips and tricks you’ve been missing out on. Time is a constant. We all have the same 24 hours in the day to get everything done. Energy is a variable. It’s the fuel that keeps you going throughout the day. It fluctuates up and down until it eventually wanes off. Energy is like your phone battery. When it’s fully charged, it works at its best. But the more you use your phone, and the more apps you have open at any given time, the faster the battery depletes. As you close a few apps and put your phone down, the battery stabilizes. Either way, if you don’t recharge it at some point during the day, it dies. Sleep: did you get your eight hours in? Food: are you feeding your body nourishing meals? Exercise: how much are you moving your body? Rest: how many breaks do you take between tasks? Environment: are the place you’re in and the people you’re hanging out with positive? Emotions: how are you feeling? All these factors determine how much energy you have at any given time. And how much energy you have determines how long it will take you to do something. When you get your eight hours of sleep, feed your body nourishing foods, and don’t have a care in the world, you perform a task more quickly (and with fewer mistakes) than when you’re feeling worn out, hungry and low. Because energy is influenced by so many factors, there are plenty of ways you can re-energize and beat the afternoon slump (I highly encourage you to use them to make your high energy time longer and your day more productive). But, unlike your phone, you can’t keep your battery full for the entire day. Eventually, your energy depletes to the point where you can’t function without some proper rest (and by proper rest, I mean eight solid hours of good sleep). Out of all the factors that influence your energy levels, sleep is by far the most important. Skimp on it and you soon won’t have the energy to do anything. That’s why cramming too many tasks and meetings into your calendar – especially to the point where you start missing out on sleep, exercise and nutritious meals – doesn’t work. Time management isn’t about how to manage time at all. 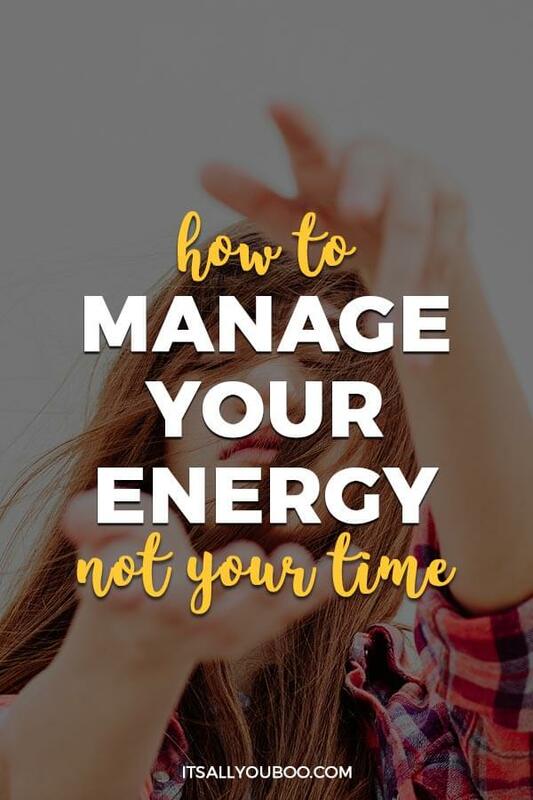 It’s not even about how to manage your energy, not your time. It’s about how to manage your energy at the right time. The best way to do it is to become aware of your high energy time and plan your day around it. Your high energy time is just that: the time of the day when you have the most energy. You’re fully awake, quick to get in the flow and ready to tackle everything that comes your way. You don’t even need a cup of coffee to wake you up or keep you going. Your body has all the energy it needs on its own. You probably heard your “high energy time” should be in the morning. If you’re a night owl and the thought of getting up early horrifies you, relax! It’s a common myth. It’s true many early birds – myself included – are more productive in the morning, but there are also plenty of people who can’t function until they’ve had their espresso shot. If you need any help to get into the productive zone, then it’s not your productive zone at all! Your high energy time is only one of the three zones of productivity you should know about to manage your energy, not your time. The others are the middle energy time and the low energy time. If would be great if your high energy time lasted forever, wouldn’t it? But, eventually, your body starts to get tired, needs more fuel to get going and things don’t flow as easily as they used to just a few moments ago. Yet, you still have enough energy to get on with your work and get a few small tasks done. You’re not as fast but you’re still in the game. This is your middle energy time. You’ll know it when you reach your Low Energy Time. It’s only the coffee that keeps you going now – and even that isn’t working anymore. The smallest task takes you hours – nothing seems to get done. Your battery is completely depleted. Your battery’s fully charged, your energy level at an all-time high. It’s your most productive time of the day. You don’t want to use your high energy time for anything that’s not absolutely important or essential. This is the time to focus on your Most Important Tasks (MITs) of the day, the things you absolutely need to get done to move forward with your projects and goals. These are also the tasks that you probably keep putting off because they usually can’t be completed in a few minutes. You think if you tackle them first, it’ll take you so much time, you won’t be able to do anything else that day. This is a big mistake. If you wait till later in the day when your battery starts running low, you won’t have enough energy to tackle them. They’ll stay on your to-do list forever. Keep you stuck where you are. But if you tackle them when your energy’s at his peak? You’ll get them done faster than you ever thought possible and still have plenty of time left for the other smaller tasks on your to-do list. Not to mention, can you imagine how happy and satisfied you’ll feel when you realize you’ve finally done that important task you were putting off for months and can now move forward with your plans? That’s what happens when you manage your energy, not your time. You’re feeling your energy is starting to deplete and you’re probably taking a power nap, eating a healthy snack or whatever you like to do to beat the afternoon slump and boost your energy. You’re in the middle energy time, the perfect time of the day to tackle all those small, repetitive and low-creative tasks that need to get done but aren’t as important. Like replying to emails, scheduling your social media posts for the week or do some research for an upcoming project (one that’s not a priority yet). This is also a good time to schedule meetings with new potential clients, mentors or investors. Any activity that you know you must do but you feel takes time away from your “real” work falls in the middle energy time. You’re probably tempted to use your low energy time for all the other things you didn’t manage to do during the day. Don’t. The low energy time isn’t meant for work and hustle. It’s meant for rest and self-care. I know you want to push through and do just one more thing but all the cups of coffee in the world won’t help you here. 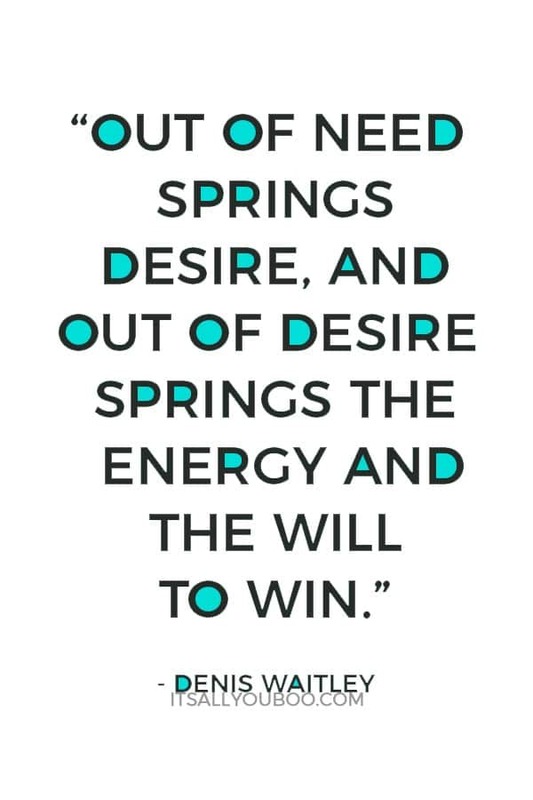 Without energy, the simplest thing becomes an insuperable hurdle. Even writing a short email takes forever and why are you making so many spelling mistakes all of a sudden? Trust me when I’m saying you’re saving time by quitting work now. So, go ahead and use this precious time for some much-needed self-care. Read a book, go for a walk, have a relaxing bubble bath… whatever relaxes you and recharges your battery. Are you ready to manage your energy, not your time? 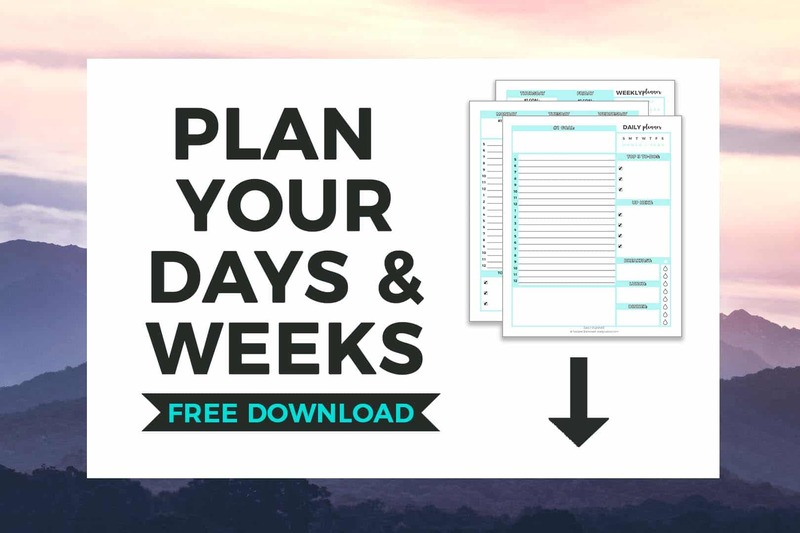 Sign up below and download the FREE Printable Daily and Weekly Planners. Next time you’re planning your calendar, resist the temptation to cram as many tasks as possible into each day. It’s a path that only leads to exhaustion and frustration. Be smart, and manage your energy, not just your time. Figure out your high energy time and make the most of it. How will you manage your energy, not your time? 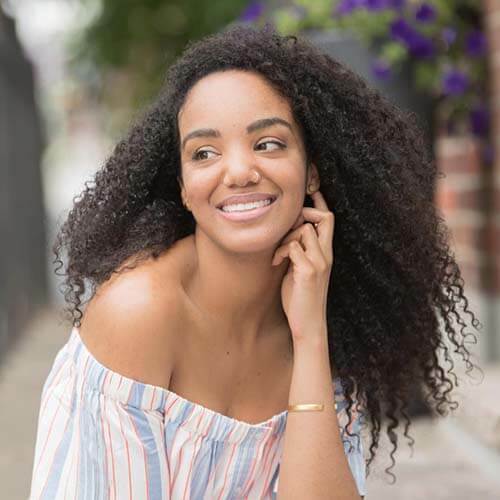 Giorgia Guazzarotti is a personal development blogger on a mission to help creative women overcome their fears, build unshakable self-love and get things done so they can achieve their dreams and live their best life. This all makes so much sense as you read it, yet i’ve never thought of energy levels like this. Thanks! Chris, it’s a total gamechanger. Once you match your to-do list to your energy levels, everything gets done so much faster! This is sound advice! Being more aware of my energy levels throughout the day should help me plan my days more efficiently. I do sometimes find myself in the rut, and not giving a project my best effort. Knowing this will help. Thanks! Kelly, I’m sure it will help. We think that, if we stick it out, we’ll get it done faster, but we’re just wasting time! You’re better off resting and getting back to the task when your energy level is higher. My high energy time is definitely from when I wake up in the AM – around 5:30/6am until about 1 or 2 pm. Then I sort of take a nose dive – which is why I get up so early, because I want to utilize my high energy and creativity!! I’m so happy I came across this post. I have read a lot on productivity and I am definitely aware of having different amounts of energy throughout the day. I am a morning person and when it comes to creativity and ideas this is the best time for me. 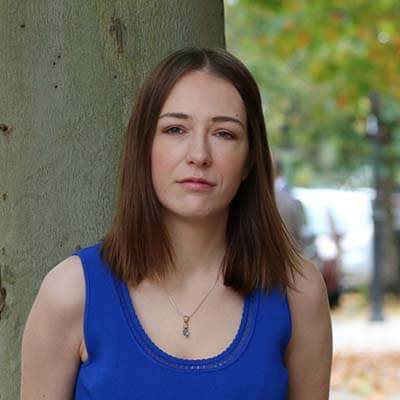 However, I far too regularly work on mundane tasks in the morning – not my big creative ideas. After reading this post I know I need to change up my routine and habits. Also, when I reach a slump I know that if I exercise this helps me get an energy boost. Thanks for the insight on this! Yolanda, glad this post helps. 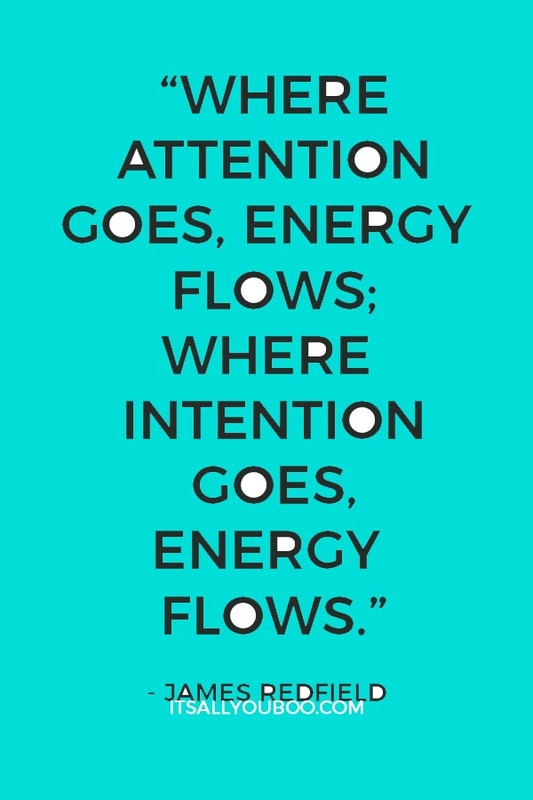 Unless a task is not urgent/very important, do it when your energy levels start to decline. It’ll still get done and won’t take time from the work that really matters to you. I feel like my high energy time is in the evenings!!! As much as I try to be this morning person, I’m not that! I’m learning that I can get so much done in the evening. It’s when I’m the most relaxed and at ease. Thank you for helping to realize that! this is so important. I am a person who puts a lot of energy where it does not need to go, leaving me drained by the end of the day. Karen, I hope this post helps you allocate time in a more useful way. Once your tasks match your energy levels, you’ll get your to-do list done faster without feeling drained. 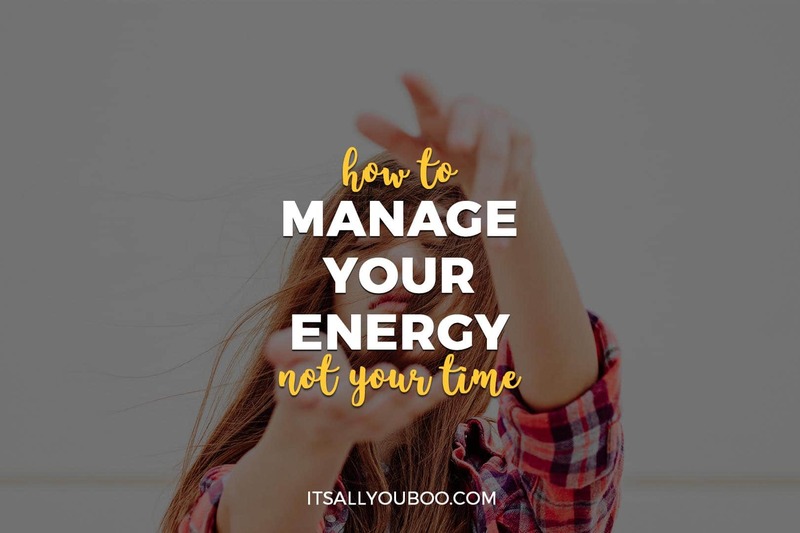 I am loving this post so much, I never thought to about managing my energy vs my time. I will definitely be taking your suggestions on how to do this. I always say that we all have the same 24 hours to use- it’s what you do with them that matters! I am bookend productive- early morning and late evening- the middle of my day is spent keeping the kids active and productive! Meg, couldn’t agree more. Well done for managing your time and your energy so well! You know what makes you so outstanding is amount of research you do, education you provide and remind people on how to better organize themselves with resources around them. You are just amazing. I am loving the tips here. It is important to have the right environment with positivity around you to progress. Stella, it really is, I agree! Love this! Managing where we put our energy is soooo important. I never get enough sleep. but its something I’m working on! I need to organize myself a little different that I do now. You are right, I keep putting off the important tasks for later. But later, when I think I have more time, I am too tired and it takes me hours to do it and I finish that I am too tired to finish it or I finish not sleeping at night. I will try to understand which are most productive hours of the day and I will change my energy management. Catalina, we’ve all been there. I did the same for years but when I figured out what my productive hours were and how to make the most of them, everything changed. I’m sure it’ll be the same for you. This is so true. I don’t get really started with anything until after 9am. I have tried to cut sleep down and all that but it doesn’t help. I just am not productive before that time. Rachel, use the early morning to rest and relax. 🙂 That way, you’ll have more energy for your tasks when you hit your High Energy Zone. My high energy is def in the morning! It’s funny because my afternoon job I mess up so much because it’s late in the day. Jasmin, I’m the same. Leave the small, less important tasks in the afternoon. They don’t require that much energy. These are awesome tips, I’m always thinking about “time, time, time” but this is actually a way better way of looking at it and dealing with it! Jessie, I’m glad you find it useful. We all have the same 24 hours in a day. It’s what you do with them that matters. What an amazing post. I feel most energetic early morning when I do most of my tasks like replying to mails or writing. It makes me feel good when I am able to finish the most important work early in the day. Kristen, thanks! It’s so rewarding when you can finish the most important work early and know you can take it easy the rest of the day.